Girard-Perregaux Cat's Eye Jewellery: What a luxury!Diamond offers a myriad of Cat's Eye watch a bright dress elegantly emphasizes the curves of her silhouette. Girard-Perregaux Cat’s Eye Jewellery: What a luxury! 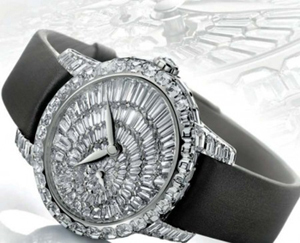 Diamond offers a myriad of Cat’s Eye watch a bright dress elegantly emphasizes the curves of her silhouette. Behind the scenes mechanics of perfection. The time you wake up in the rhythm of a movement with automatic winding Girard-Perregaux manufactory. The Cat’s Eye jewelry enacts his savoir-faire in which beauty and art come together in perfect harmony. His dress and white gold. Her embroidery of diamonds. Coated with 150 precious stones, emerald cut, the case illuminates her feminine curves. The crown-shaped flower opens its petals to reveal its heart, a rose-cut diamond. The “circle” of the hour is held on a patch of gems that accentuates the iconic shape of the box. From small seconds, the oval sparkling extends progressively into a uniform brightness. The dial features a subtle pattern of “Clous de Paris “, counts 102 diamonds emerald cut, selected and positioned to give all of their luster. Ancient technique that requires a particularly delicate touch, the “Clou de Paris” is to hold more stones with one “highlight”. For he that embedding the diamond, it means then do a through job of cutting and sizing of stones, one by one. A sapphire, convex in both directions, is of the dial with its leaf-shaped hands. A strap satin taupe color highlights stones. Contrast, thin, and the union failed. Ardillon its buckle embellished with 13 baguette-cut diamonds, wraps the wrist of an accomplice in moments unforgettable time. Finally, the hand-engraved caseback reveals the mechanical movement with automatic winding, Caliber gp03300, whose rotor is fully decorated with the logo of manufacture. The meeting is done. Infinitely precious. Founded in 2004, the collection Cat’s Eye dedicated to the female of elegant timepieces watches, whose refinement is its rival’s attention to detail. Its iconic design that sets it apart, and highlighted with precious materials and handmade movements, simple or complicated. And this proves that the end is far from clockwork universe male prerogative.